When Hawthorne’s summer harness racing meeting began this year in early May, trainer Dale Kanitz was just happy his small stable got stalls on the track’s backstretch. Little did Dale know, that four months later he would be with elated friends and family in the winner’s circle on Hawthorne’s Night of Champions, because the horse that got him there wasn’t even in his barn when the meet got under way. 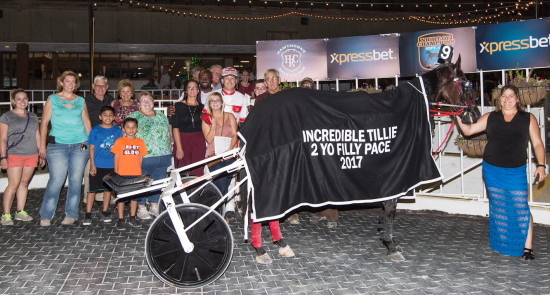 The Incredible Tillie 2-year-old filly pace champion, Fox Valle Jazzy was acquired by Kanitz in mid-June and would go on to end her first season of racing with four consecutive victories, including three series legs and the final, a gaudy record of 8 wins, two seconds and two thirds in 13 starts, and with over $130,000 on her card. “I was thankful Hawthorne gave us stalls when no one else would,” said the 69- year-old Kanitz from Olney, Illinois. “I was stabled right next to Demarrio (Gary) Brown, a friend of mind from Mississippi. “My wife Cathy and I always attended the Walker Sale every year but we did miss the one in 2016. That’s when Gary bought Fox Valley Jazzy for $1,800. Fox Valley Jazzy is a Yankee Skyscaper filly and the first foal of LR Dancing Dream, a daughter of Ft Apache Hanover bred by Tim and Diane Wilson of Martinsville, Illinois. LR Dancing Dream won 30 races in her six years of racing and was twice the runner-up in Super Night Championships at Balmoral Park. As a 4, 5 and 6-year-old she raced in high-level conditioned races, or Preferred events on the east coast. LR Dancing Dream made over $330,000 in that three year span, twice winning in 1:50.3. 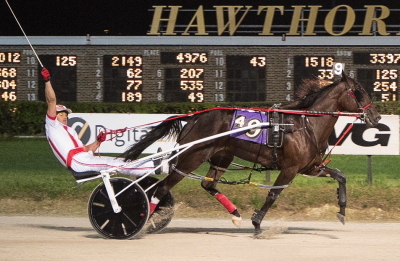 Before Fox Valley Jazzy joined Kanitz, she won her 2-year-old debut on June 8th at Hawthorne in 1:55 flat and followed with a victory a week later in the first leg of the Incredible Tillie stake series when she was hammered down to 1 to 9 odds with driver Tyler Shehan. In her first start for the Kanitz’s, Fox Valley Jazzy finished third in her Violet elimination. She did finish a disappointing sixth in the Violet Final, however, two starts later the freshman filly was a solid second in another series leg of the Incredible Tillie. Soon after Shehan went back to his home state of Kentucky that gave Ridge Warren an opportunity as the filly’s driver and the 28-year-old certainly made the most of it. Warren posted back-to back wins at Hawthorne with the filly and was second with her in the Springfield State Fair Final. “As the summer went on the filly just got better and better,” said Dale. Fox Valley Jazzy rattled off triumphs in her final four races as a 2-year-old, capped by her convincing 1:54.3 season best clocking in the $175,000 Incredible Tillie Championship. What kind of a filly is Fox Valley Jazzy? “She’s a sweetheart to be around,” added Dale’s wife Cathy Finn-Kanitz, who trained horses at Balmoral, Maywood and on the Illinois County Fair circuit in the middle of the 2000’s. Cathy also took care of Fox Valley Jazzy when the filly competed at Springfield. Dale is looking forward to the upcoming winter meet at Hawthorne, however, his prize filly won’t be with him when the meet gets under way on Friday, January 5th. Let’s Try Again: Horsemen have their fingers crossed that the weatherman will be more cooperative for this Saturday’s Fall Review Two at the Springfield State Fairgrounds, after last week’s card was cancelled because of inclement weather. With 87 horses entered this time around, again 17 ICF divisions were carded with a 12 noon first post time. The first five races are for 2-year-olds with the $115,000 Kadabra champion Illinimight (Mike Brink), heading up the opener for 2-year-old ICF colt trotters. The $175,000 Incredible Tillie runner-up Rollin Coal (Bobby Smolin), a winner in the first Fall Review, raced two weeks ago goes in the second race, first division of the freshman filly pace. Backstreet Lawyer (Mike Oosting), second best in the $195,000 Incredible Finale on the Night of Champions, looks to make it back-to-back Fall Review triumphs in the fourth race 2-year-old colt pace. The $60,000 Maurello champion Bucklegirl Bobette (Kyle Wilfong), a winner in the first Fall Review, is back for another go at it in Saturday’s 14th race for 4-year-old and up ICF mares. The Hart Walker owned and trained mare didn’t enter for last week’s Fall Review and instead finished fourth, pacing in 1:51 flat, in a $10,000 conditioned race at The Red Mile, after leading the field at the 3/4 mile pole reached in a quick time of 1:22.1. Hoosier Happenings: A trio of Illinois bred 3-year-old pacers are racing Saturday might in divisions of the Circle City stakes at Hoosier Park. The Tom Simmons Stable’s Fox Valley Herbie goes in the $37,600 fifth race first split, while Slzburgerslzburger, owned by the Engel Stable of Buffalo Grove, IL, and Gabe Henry, from the barn of Tom Graham Jr., compete in the $37,900 second Circle City division. Thursday night at Hoosier Park the ICF trotter Annas Lucky Star finished fifth in the $68,000 Circle City stake for 3-year-old fillies and My Kind Of Dance was fourth in the stake’s $50,000 2-year-old pace for fillies. Steve Searle’s Trotting Grace was slated to race in the $73,600 Madison County stake, however, the Illinois bred freshman filly trotter came up sick and had to be scratched.